Are you having a hard time trying to find walkie talkie toys for your kids? With so many options available, it can quickly become overwhelming. That’s why we’ve taken care of the hard part for you. We have researched and reviewed what the top walkie talkies have to offer. All you need to do is have a read through the options below until you find the one that sticks out to you the most. A buyers guide section is also available at the end to provide you with additional information! 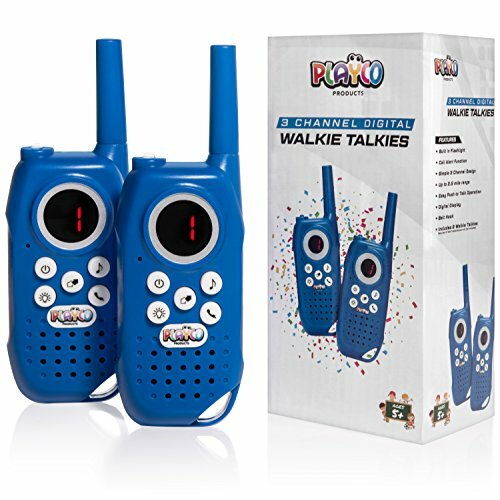 Playco’s Walkie Talkies come with a 3 channel feature that allow kids to start using it easily within seconds. We liked how there’s a function that keeps the channels locked in to ensure that kids can’t accidentally go onto the wrong channel. Parents have been impressed with how long the battery life lasts for. It means you can let your kids run around and play together for hours on end. We liked how there’s an excellent flashlight available. This keeps children safe when playing in the dark and can be fun for them to use. They have a blast coming up with pretend play scenarios on different ways to play with the walkie talkies. This set even has a belt clip that makes it easy to carry around. The long battery life ensures that your kids can have fun playing creatively for hours on end. It’s super easy for them to use and the flashlight keeps them safe if they’re in the dark. 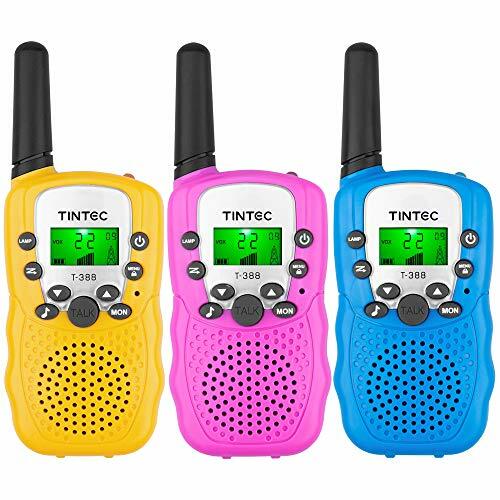 This Tintec 3 Pack Walkie Talkies set features 2 channels which allow kids to communicate with each other clearly while being up to 2 miles away from each other. It has a powerful anti-interference feature that keeps other distractions off the channel for clear communication. We liked how it has a camouflage design as it makes it more exciting for kids to play with and use in their pretend play games. As a result, it encourages them to think with more creativity. In addition to this, it has a push-to-talk function which makes it super simple for kids to use when playing on their own. They’ve created the walkie talkies with an ergonomic design to make it comfortable for kids to hold. Not to mention, the exterior materials are made out of durable plastics. The anti-interference feature lets kids be up to 2 miles from each other and still be able to communicate clearly. It’s also very easy for them to use which means they can play independently. 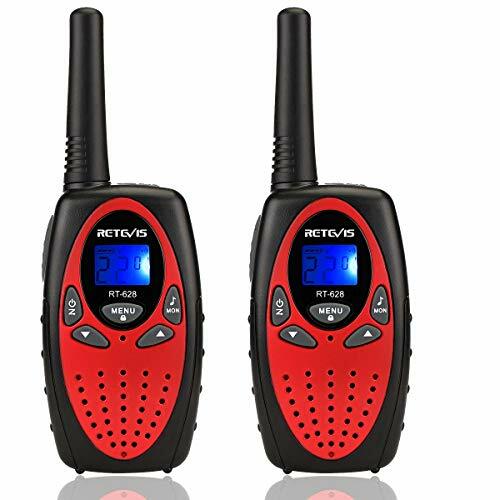 The Retevi RT628 Kids Walkie Talkies have been created with a small and lightweight design that makes it very easy for kids to use and run around with for hours on end. We also liked how the functions are easy for children to use to play on their own without any hassle. In addition to this, a belt is available which children can use to clip the walkie talkie to. This enables them to run around and play freely without worrying about having to carry it in their hand the entire time. There’s an excellent feature that allows for additional walkie talkies to communicate on the same channel. This encourages kids to play in larger groups which can be awesome for improving their social skills. 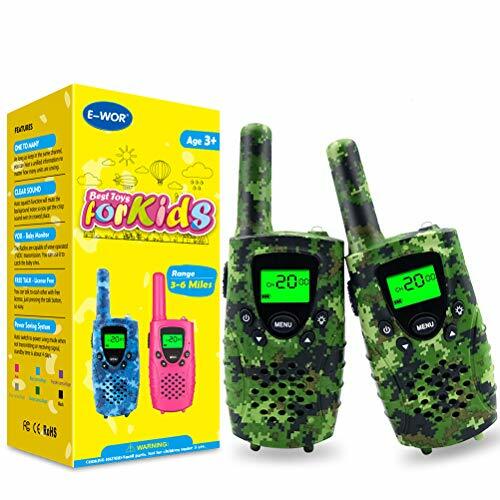 Due to how easy the functions are to use and how multiple walkie talkies can communicate on a single channel, kids can have a blast playing in larger groups. This can be effective for developing their creative thinking and social skills. The Boys Toys Walkies Talkies have been made with a design that’s ergonomic and lightweight, which makes it easy for kids to carry around for hours of fun. We also liked how it’s very simple for kids to use on their own. They’ve implemented HIFI acoustical quality sound which ensures that kids can communicate to each other clearly. Moreover, an auto-squelch feature is available which works effectively to remove any background noise. There’s an impressive 4-mile range which works best in open areas. However, in places that are more built-up, the range is closer to around a 1 mile range, which is still plenty for kids to have fun with. A flashlight has also been built-in which is great for keeping your kids safe in the dark. The clear sound features make these walkie talkies awesome for using in busier areas to ensure clear communication. With a flashlight, you can also be sure that your child can be safe when playing in the dark. Funkprofi’s Walkie Talkies feature an awesome auto-squelch system that works to drown out any background noise to allow for clear communication in busier places. There is a 3 mile range which works best in open areas – the range is a little less around residential places. We liked how they’ve made this one super easy to children to use. This is a result of the simple push-to-talk function as well as the VOX hands-free feature. Therefore, you can leave your kids to have fun playing with this toy for hours on end. In addition to this, there’s a channel locking feature which prevents them from accidentally going onto other channels and losing communication. The LCD display that’s available is also bright and clear to read, even in the dark. The channel locking and push-to-talk features make these walkie talkies excellent for kids to play with independently without any issues. This Veroyi Walkie Talkie has a 3 mile range which lets kids be pretty far apart from each other and still be able to communicate clearly. There are also 22 channels available that let kids choose between the clearest channels. 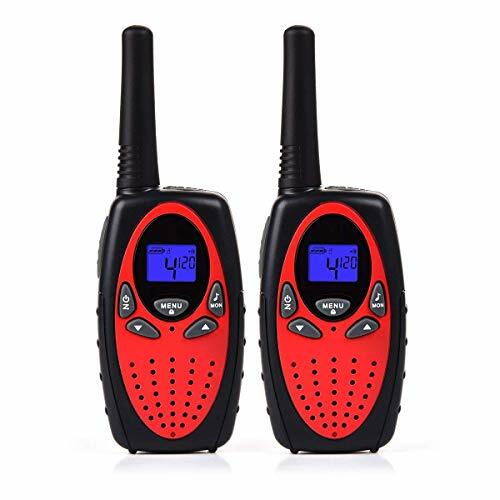 The instructions that are available are easy to follow and ensure that your kids can start playing with the walkie talkies as soon as possible. They have an absolute blast being imaginative and using them in their pretend play scenarios, which is great for their creative thinking skills. 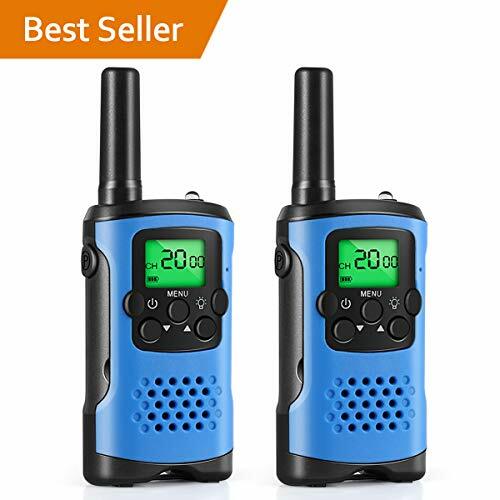 Furthermore, they have made these walkie talkies with a small and lightweight design. As a result, you can expect your child to have an easy time carrying it around for endless hours of outdoor fun. 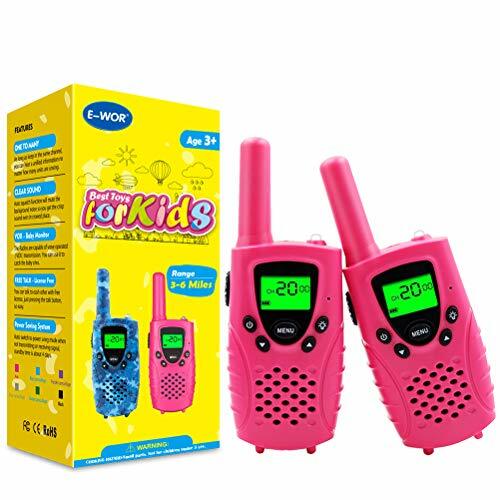 Kids love using these lightweight walkie talkies to play outdoors together and have fun coming up with creative games for hours on end. ROSKY’s Kids Walkie Talkies come with a 2 mile range and 3 channels that allow kids to communicate with each other over longer distances. Therefore, they’re given more freedom to play with plenty of imagination. The design is small and lightweight while also being ergonomic. As a result, your kids can carry them around comfortably for hours of outdoor play without any problems. We also liked how they have implemented a push-to-talk function. This makes it incredibly easy for children to use to ensure that they can play independently. Moreover, parents can have a peace of mind in knowing that they’re kids will be safe because of the intelligent alarm system. The built-in flashlight is also great for keeping your children safe when they’re playing in the dark. This walkie talkie set is super easy for kids to use which allows them to play on their own and be highly creative for hours. The alarm system and flashlight also mean that they can remain safe too. 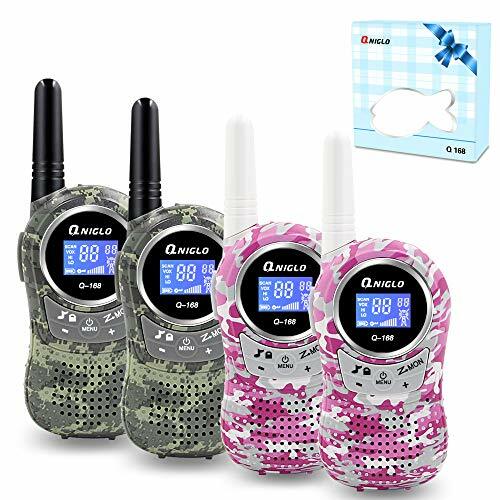 The Little Pretender Walkie Talkies have a 2 mile range and 3 channels that allow kids to communicate clearly with each other over further distances. As a result, they’re provided with the freedom to think of more creative ways to play. We liked how there’s an LCD screen that’s bright and easy to see in the dark. A flashlight is also available that helps children to stay safe when playing outside when it’s dark. In addition to this, they’ve included a belt clip that lets kids carry the walkie talkie around easily. The ergonomic design is effective at ensuring that kids can hold the walkie talkie and play for hours on end outdoors while being comfortable. Furthermore, the push-to-talk function makes it incredibly easy for kids to use on their own. The push-to-talk function makes these walkie talkies remarkably easy for kids to use on their own to play more independently for hours outdoors. 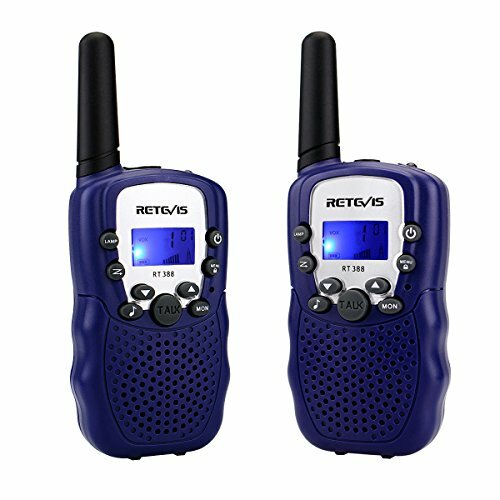 This Retevis RT-388 Kids Walkie Talkies has an impressive VOX function that enables kids to use it hands-free. We also liked how they’ve included a built-in flashlight as it works effectively to keep your child safe while playing in the dark. Not to mention, the bright LCD screen that’s available is easy to read in the dark too. A keypad lock feature allows you to use certain settings that your kids can’t change. This means that they can stay on the same channel and not accidentally switch and lose communication. Children have been having a blast using these walkie talkies to play outdoors for endless hours with their friends. They’re highly effective for encouraging kids to play more creatively and improve their social skills. The VOX function allows kids to use the hands-free mode which can be a lot of fun. Not to mention, they can play outside safely in the dark as a result of the flashlight and bright LCD screen. 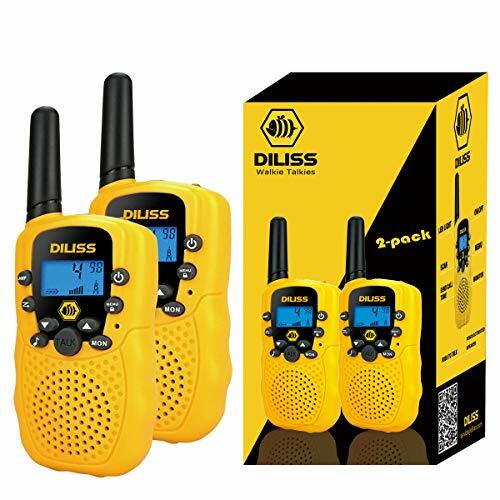 The DilissToys Walkie Talkies come with an auto-squelch feature that works effectively to minimize any background noise to allow kids to talk clearly in busier places. They can also communicate with each other across longer distances because of the 3 mile range and 22 channels that are available. 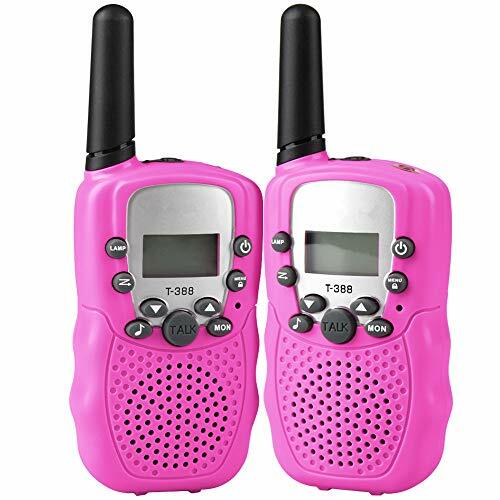 Children also have an easy time using these walkie talkies. This is a result of the simple push-to-talk feature that lets them play independently. We also liked how there’s a built-in flashlight that keeps kids safe in the dark. The LCD screen that’s available is also very bright which makes it easier for kids to see in darker environments. Moreover, they’ve designed the walkie talkies with an ergonomic design which makes it comfortable for kids to play with for hours. Kids can easily communicate with each other due to the push-to-talk function for more independent play. Furthermore, they can communicate clearly due to the auto-squelch function that’s available. 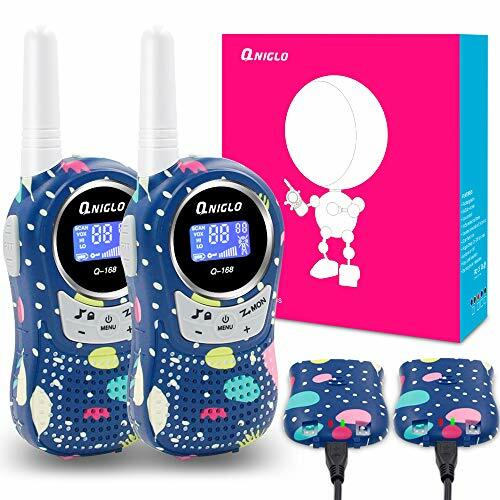 The ALANGDUO Walkie Talkie has been created with a fantastic small and lightweight design that makes it effortless for kids to carry around. An ergonomic design has also been used which ensures kids can have fun playing with it for hours in comfort. A belt clip is also available to make the portability even easier. Children have a blast implementing this belt clip and the walkie talkie in their pretend play scenarios, which is awesome for their creative thinking skills. An auto-squelch feature is available too. This works effectively to remove any background noise for clear communication. The volume can also be easily adjusted for children. This is a fun and easy-to-use walkie talkie that lets kids run around with it easily for hours and play with a ton of imagination. This Voice Changing Walkie Talkie set by Kidzlane features 8 channels that lets kids communicate to each other clearly across a range of 2 miles. They have an absolute blast using the voice changing feature as they’re able to use it to play more creatively. A flashlight has been built-in which works well to keep your child safe when they’re playing in the dark. We also liked how they’ve implemented a push-to-talk function as it’s super easy for kids to use. As a result, you can let your child have fun running around to play independently. The belt clip that’s included means that they don’t always have to worry about carrying it around as well. The built-in flashlight, belt clip, and push-to-talk features work tremendously well to allow kids to run around and play with their friends outdoors independently. 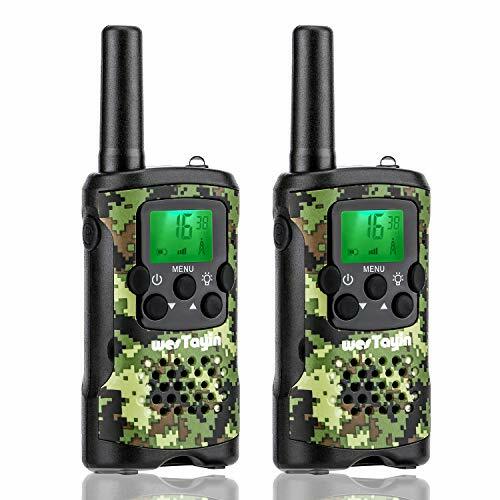 The Qniglo Walkie Talkies have a fantastic camouflage pink and green design which look fantastic. These designs make it a lot more fun for kids to play with and encourages them to use the toys in more creative ways. There are 22 channels available that allow for kids to talk to each other at a range of up to 3 miles apart. Furthermore, there’s an LCD back lit display which is easy to use and read in darker environments. You can also be sure to leave your kids to play independently as the walkie talkies are lightweight and have an ergonomic design. The sound quality is also incredibly high to ensure that kids are able to easily hear one another, even in crowded places. The lightweight and ergonomic design makes these walkie talkies super easy for kids to play with for hours. We also liked the fun camouflage design as it inspires kids to play with more creativity. 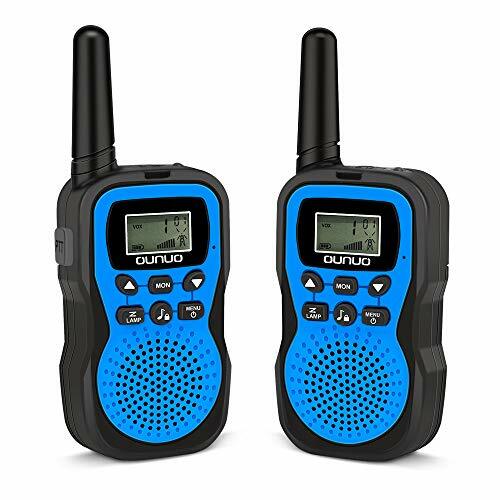 These Qniglo Walkie Talkies come with batteries that can be recharged which means you can save money on buying new batteries all the time. After being fully charged, they can last for around 18 hours of talk time and 5 days on standby. The design is smaller and easier for kids to hold. As a result, they’re able to run around and play outdoors for hours on end without any issues. There are 22 channels available and a range of up to 3 miles in open areas. We liked how they’ve implemented a push-to-talk function as it makes it incredibly easy for kids to use when they’re playing on their own. Therefore, they can be left to play independently, which is great for their creative thinking skills. .
Children have been loving how they can use the easy push-to-talk feature to play with their friends without any issues. It improves their ability to play independently and more creatively. The ComVox Walkie Talkies have 3 different channels as well as a 3 mile range in open areas. Therefore, kids are able to play outdoors and have a blast together for hours of fun. It encourages them to be outdoors more often which is awesome. We liked how they’ve implemented a feature that prevents any interference while kids are talking on the channels. This ensures that they can play with no disruptions for a better experience. Furthermore, the clear voice technology that has been built-in means that kids won’t have any issues hearing each other. Not to mention, the ergonomic design allows kids to easily run around and play comfortably. The 3 mile range, clear sound quality, and minimized interference allows kids to play outdoors together for hours on end to come up with creative play scenarios. 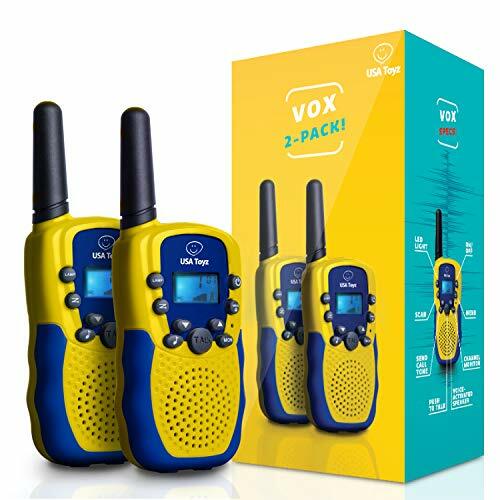 These Vox Box Walkie Talkies have a range of 2 miles which allows kids to play outdoors for hours in highly imaginative ways. As a result, you can expect your child’s creative thinking skills to improve. An LED flashlight has been built-in which works effectively to allow children to keep themselves safe when playing in the dark. We were also impressed with how they can talk to each other without having to press a button. This is because these walkie talkies automatically send the message when you start talking. Therefore, it’s super easy for younger children to use on their own. The sound quality is also very clear. 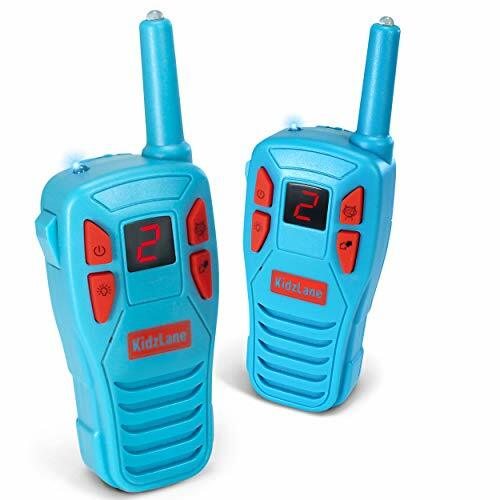 The automatic voice recognition feature makes these walkie talkies super simple for kids to use on their own as they don’t require them to press any buttons. Instead, they can just focus on playing creatively. 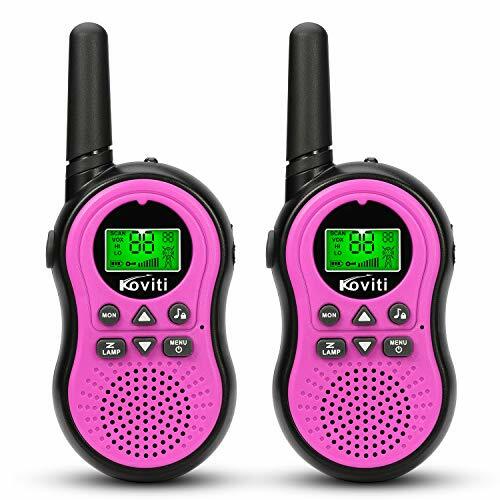 These Koviti Kids Walkie Talkies have 22 channels and a 3 mile range in open areas. The range may be lower in built-up areas but it still provides children with a lot of space to run around and play creatively while remaining in contact with each other. As a result, their creative thinking abilities are able to develop well. We also liked how they’ve implemented a flashlight into the walkie talkies as it keeps kids safe when they’re playing at night. Moreover, the LCD display is bright which makes it easier to use in the dark. We also liked how there’s an auto-squelch feature available that reduces all background noise. This allows kids to clearly speak to each other, regardless of how noisy it is around them. You can be sure that your kids are able to play together in highly creative ways to due to the high-quality audio and impressive range that’s available. KISSDA’s Walkie Talkies have been made using high-quality materials which ensures that they remain durable for years to come. We liked how they’ve ensured that the sound is of a high-quality too. This ensures that kids are able to clearly hear each other. This is especially since they have implemented an auto-squelch function that works effectively to minimize any background noise. Kids are also able to communicate over 3 different channels and be within a 2 mile range. As a result, they are given the freedom to play in more open spaces, which is awesome for their imaginative play abilities. The auto-squelch feature ensures that kids are able to easily communicate, no matter how noisy their environment is. Due to the 2 mile range, they’re also able to play in larger areas and be more creative. 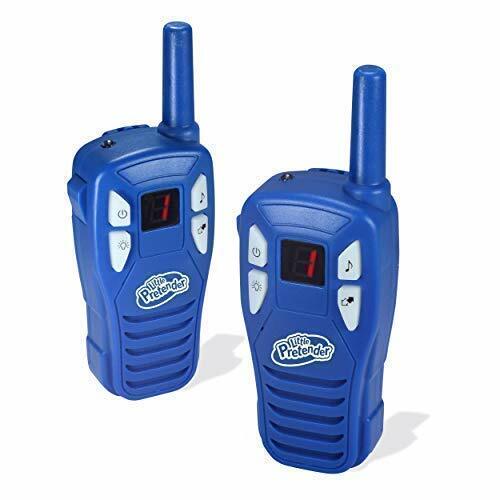 These walkie talkies feature 22 channels and have an impressive 4 mile range in open areas. Therefore, kids are provided with a wide space to play together outdoors and be super creative. There’s an excellent VOX feature available that lets kids take advantage of using the walkie talkies with a hands-free approach. We also liked how they’ve implemented a flashlight into the design. It works effectively to keep your child safe when they’re playing at night. Moreover, a 2-way radio function is available which can make it easier for kids to communicate with each other. The 4 mile range in an open area allows kids to play with a lot of imagination. We also liked the built-in flashlight as it lets kids play in the dark safely. The WesTayin Walkie Talkies have a standard 2 mile range which allows kids to play in open areas to be more imaginative with how they play. As a result, their creative skills are able to develop well. We also liked how the sound quality is high. This allows kids to speak to each other clearly without having to turn the sound up too loud. In addition to this, a green LED light has been fitted. This notifies children of when they may need to switch channels. Not to mention, the materials that have been used to construct these walkie talkies are of a high standard. This keeps them durable for years of play. 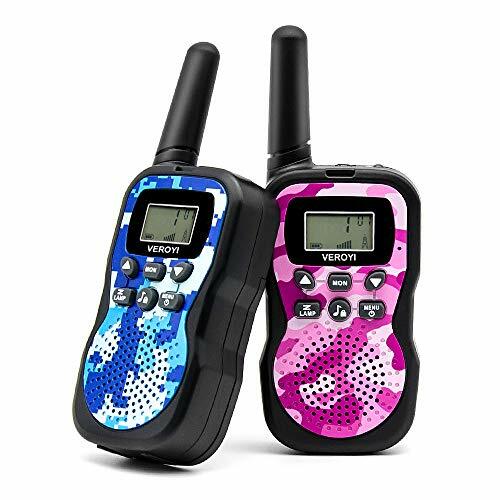 Kids have a blast using these walkie talkies to communicate over a 2 mile range as they’re able to play in more open areas and be as creative as they like. 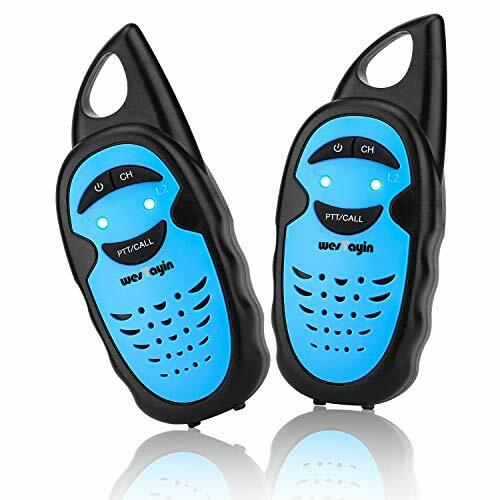 The E-wor Walkie Talkies has a lightweight and ergonomic design which makes it very comfortable and easy for kids to carry around with them without any hassle. We liked how there’s a push-to-talk function available as well. 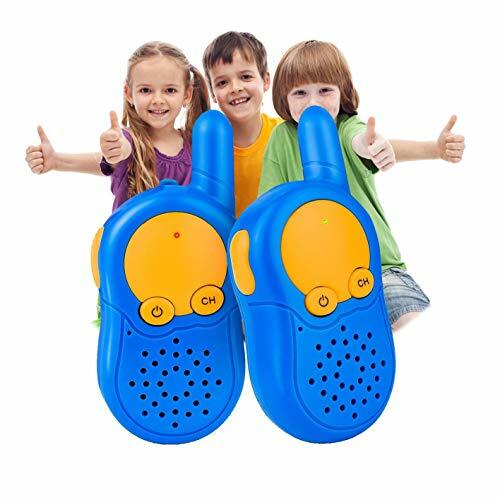 This ensures that children are able to easily use the walkie talkies on their own to play more independently. In addition to this, they’ve implement HIFI acoustic sound quality which is of a very high standard. An auto-squelch feature is also included which minimized any background noise to help children hear one another clearly in busier areas. Not to mention, there’s a 4 mile range in open areas which enables kids to play in large spaces to be highly creative. The push-to-talk function, HIFI sound quality, and ergonomic design ensure that kids are able to play creatively with each other for hours on end without any hassle. The OUNUO Kids Walkie Talkie Toys has a built-in flashlight that works effectively to light up the area to keep your child safe in the dark. We also liked how the buttons that are available has a large design. This makes it easier to children to use. In addition to this, the quality of the sound is high to ensure that kids can easily hear each other. They can use the adjustable volume setting to change how loud they want to hear the other person. Not to mention, and auto-squelch feature is available too. This reduces any background noise to make the communication as clear as possible. There’s also minimal radio interference. People have been loving these walkie talkies! Kids have an easy time using these walkie talkies because of the larger buttons and auto-squelch features that are available. They can also be safe when playing at night due to the built-in flashlight. 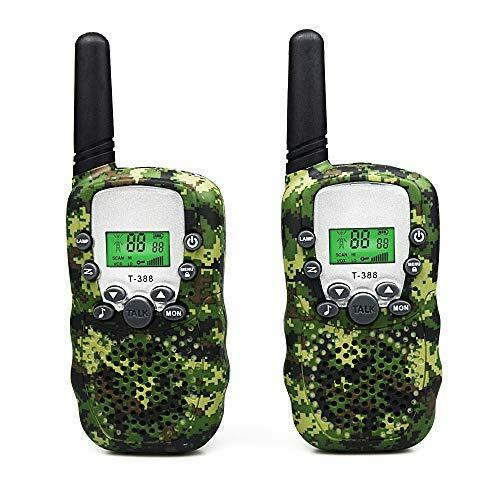 This Aphse Walkie Talkies set has been made using high-quality materials that are environmentally friendly and durable. Therefore, they can last your child for years of play. We also liked how they’ve designed them to be ergonomic and easily portable for kids. The quality of the sound is high to ensure that kids can hear each other clearly. Even if they’re in louder environments, the auto-squelch feature works effectively to minimize any background noise. In addition to this, there are 22 channels available and a 3 mile range. This allows kids to play in more open outdoor area to have a ton of fun. As a result, you can expect their creative thinking skills to develop well. Kids have a lot of fun running around in larger areas and being able to clearly communicate with each other and remain comfortable with the ergonomic design. It helps them to focus on playing more imaginatively and having fun. Now that you’ve read through what some of the best walkie talkies for kids have to offer, you can start narrowing down your search to find the right one for your child. However, we understand if you’re still not feeling 100% certain on which one to go with. That’s why we’ve created this buyers guide section. It includes a ton of great information about the types of walkie talkies available, as well as the most popular brands. By the end, you’ll be feeling great about making a final choice. 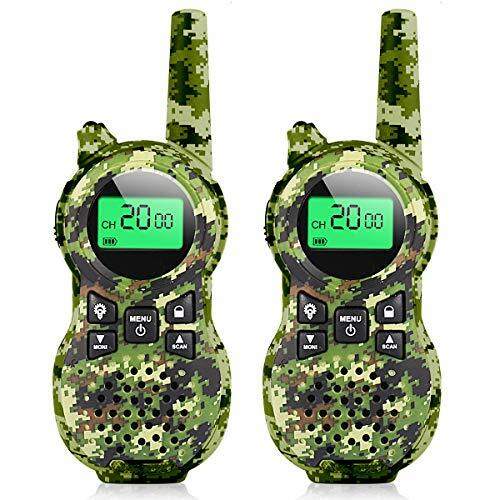 After reading through the review above, you will have seen that there are a number of different kinds of walkie talkie toys available. There are a couple others that kids have been having fun with too. To learn more about them, take a look below. There are some awesome walkie talkie toys available that are built into the style of a watch. This allows kids to wear their walkie talkie around their wrist and run around without any hassle. They are super easy to use and are less likely to be damaged from being dropped since they’re attached to your child. The walkie talkies that have a police design are another fantastic option. They usually have bright and colorful designs that represent the police force, which makes it more exciting for children to play with. As a result, kids feel encouraged to use it to play with a lot more imagination, which is great for their creative thinking skills. You may have also noticed that there is a variety of different brands available when it comes to walkie talkies. If you were interested to learn a little more about these top brands, this is the section for you. Discovery Kids has been in the business for more than 40 years and they’ve developed a fantastic reputation for manufacturing high-quality toys that kids have been loving. Their toys range from ones that great for helping babies to develop, to ones that entertain older children for hours. They design their toys with the outlook that kids learn best from play, and their toys are super fun and educational. Fisher-Price has been a popular children’s toy brand among parents for years. This is because they make toys that inspire children to play with more imagination, which is excellent for improving their creative thinking skills. They have a passion for making high-quality toys that allow children to have a blast, while also being able to develop themselves. Research and safety are 2 major factors that they always take into consideration with all of their toys. Nerf comes under Hasbro which is a global company that has gained an incredible reputation over the years for manufacturing high-quality toys that kids have been loving. Their toys are also very effective at encouraging children to play with more imagination in groups. As a result, their social skills and creative thinking abilities are able to develop well. Spy Gear is a fun brand that kids love using to play with plenty of imagination. The nature of their spy toys make children feel like spies, which can lead to some entertaining pretend play games. So, that concludes our review on what the top kids walkie talkies have to offer. Hopefully, we’ve provided you with everything you need to know. Be sure to read through the main features, pros, cons, age recommendations, and what makes each one stand out. That’s what will give you the best idea of how to go about picking the right one for your child.